The first remarkable film of 2008 is here, and most of you haven’t heard of it. David Gordon Green’s Snow Angels is a poignant examination of small-town life, much in the way of In the Bedroom and The Ice Storm. Green takes the characters from Stewart O’Nan’s novel, and forms a powerful adaptation full of twists, turns and classic cinematic drama. A series of narratives are introduced through our many characters. There isn’t just one central plot to follow, a hard feat that the film tackles with sly ease. Arthur is a loner, highschool band kid who begins to fall for the desperately cute Lila. Their tender relationship is the backdrop for a separate, tumultuous affair that wrecks havoc on the town. 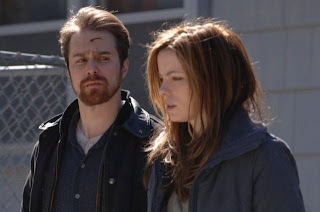 Arthur’s old baby sitter Annie (Kate Beckinsale, breaking us down with her eyes) is trying to support her daughter and keep a safe distance from her separated husband Glenn (a miraculous Sam Rockwell). Snow Angels is so layered and deep, it would be criminal to share any plot details. Once Glenn returns to the town (after a few months away, from where, I’ll never tell) with a new religious attitude on life, conflict is bound to ensue. He’s given up booze and wants to be a part of his wife and daughter’s lives. Annie gives him a few chances, but she has her own problems to face, not finding the time to baby sit a grown man. As young, talented actors, Beckinsale and Rockwell have never impressed this much before, these are the best performances they have ever delivered. Oscar nominations, please. Beckinsale buries her British beauty and encompasses her every manifestation into Annie. The result is a daring and harrowingly gut wrenching performance. Rockwell, who has proved himself before with Heist, Confessions of a Dangerous Mind and Matchstick Men gives his Glenn s hauntingly razor-sharp edge. His tortured, bearded face won’t be able to escape your thoughts, days after you leave the theatre. Olivia Thirlby (we’ll be seeing a lot of her) hides behind her thick glasses, shadowing herself from her breakout role last year as Juno’s best friend. Thirlby, whose first role was as a passenger on United 93, is a perfect match for Michael Angarano’s Arthur. The two have more chemistry then most adult actors in movies today.